Anyone who grew up or lived in Brampton probably knows their own version of ‘The Brampton Mile’. A legendary mile long stretch of Chatsworth Rd which at one time was home to about twenty Public Houses, Inns or Taverns. ‘The Mile’ won’t be found in any guide book (except the Dirty Stopouts Guide) but became renowned among those who tried, and often failed, to take a drink in each of the hostelries from the Terminus to The Square and Compass on West Bars. It is though, a part of the folklore which makes Brampton unique. 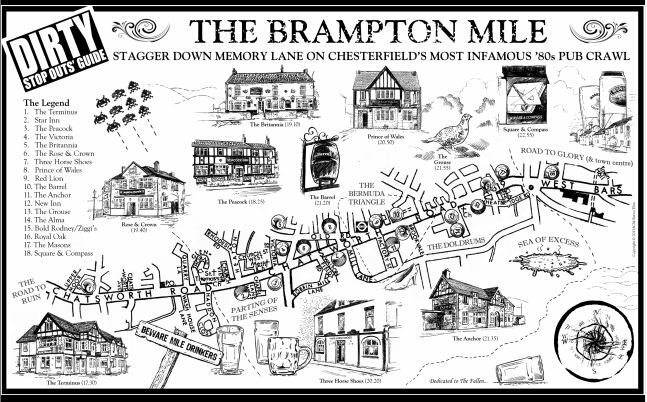 We will be publishing a page illustrating The Brampton Mile soon.. Any stories of attempts to complete the course welcomed.